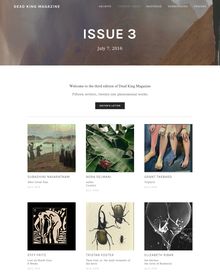 Dead King is an online publication of poetry, short prose, essays, and art. We aim to prioritise and showcase the work of writers who have experienced or continue to experience precariousness. We aim to publish incredible, innovative work in beautiful online editions. We are overtly political. Creation is a political act. Writing is nothing without this acknowledgement. As such, we aim to prioritise writers who continue to survive precariousness. If you’re writing from a position of precariousness we want to hear from you. YEssay Essay 1,000 - 3,000 words. AArtwork Artwork Minimum of 2 pieces.